Bastion costs $4.99. Help us help you. Friday afternoon has finally arrived, and we need a drink, stat. We also need to kick off another $15 iTunes giveaway. That said, let's begin. 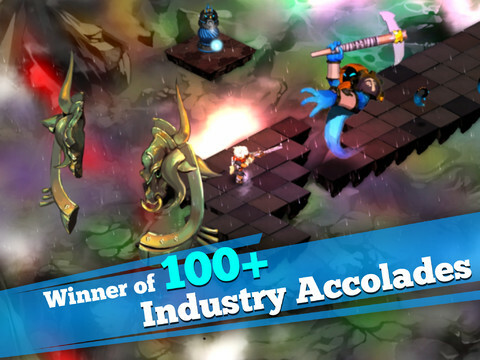 Bastion...one of the best iPad games we've played. Basically, we give away a gift card every Friday, and you could totally win this precious virtual loot, then use it to buy whatever you desire. Could be some games, or even a few movies. There's also a controversial and military-themed book coming out soon. At least we heard as much. With this in mind, enter by leaving a comment below letting us know what you plan to buy, should you win, obviously. To enter, you MUST (must, must, must) be a resident of the United States, or at least have access to the U.S. App Store and a U.S. powered Apple device. We'll randomly draw the winner this Monday, September 3. Good luck! In the meantime, here's a sampling of this week's iOS games.